The extraordinary vision and panache of Scott Hahn's books have made Catholic theology thrilling and accessible for millions of readers inside and far beyond the boundaries of the Church. In First Comes Love, he not only reflects on the nitty-gritty of life, love, relationships, marriage and family but shows how the family draws us into the mystery of God. In recent years we have seen the family, as an institution, in decline, often portrayed as a place of repression and fear rather than of openness and love. Most marriages end, bitterly, in divorce. Yet, argues Hahn, our only hope of regaining happiness and wholeness lies not in attacking the family but in a recovery of our understanding of the family as the heart of God's plan for creation. Theology and biblical interpretation take on the excitement of an adventure story is this irresistible and often moving reflection on love, the family, the Trinity, and the Church. This new edition includes a new chapter by the author. First Comes Love by Scott Hahn was published by Darton Longman & Todd in April 2007 and is our 45979th best seller. 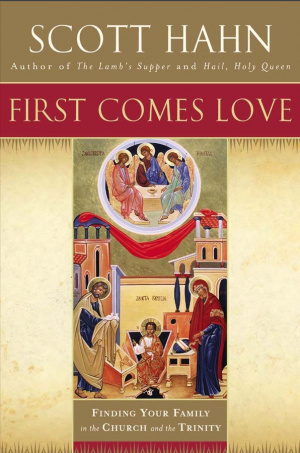 The ISBN for First Comes Love is 9780232527025. With regular reference to the Catechism of the Catholic Church and the statements of Pope John Paul II, Hahn’s text and his theology are a faithful reflection of the teaching of the Roman Catholic Church. His theme is ‘Finding your family in the Church and the Trinity’. It may be significant that the book’s cover has a modern Western icon showing the Holy Family Jesus, Mary and Joseph below a version of Rublev’s famous Trinity icon. This, the human family, reflects the Holy Family who reflect the Trinity. Hahn goes so far as to attribute family characteristics to the Trinity – not everyone will agree with him. Got a question? No problem! Just click here to ask us about First Comes Love.